Currency converter. Convert and calculate all currencies in live mode. Just enter the amount in your interested currency field and converter will show you the worth of other currencies automatically. You can set up a currency calculator and add or remove the currencies that you want. The exchange rates are constantly changing, yet this smart currency converter updates exchange rates in live mode, so the conversion results are always accurate. Below the calculator there is a chart of the currency pairs you're trying to count the value of, so this helps to imagine the past and the future of the currency exchange rates. We've prepared a separate page for each currency pair and on each of those pages you can add and modify your converter on your own. More than 140 different currencies’ data updates appear each second and each pair's converter generates charts next to the calculator. So, please feel free to use our smart currency converter, as well as follow live currency rates and charts. The most popular currencies in the world are, of course, US dollar and Euro. However, there are many travelers in different countries with different currency, so the currency exchange is still relevant and needed. The most popular currency conversions are: US dollar to Euro, Euro to British pound, US dollar to British pound, US dollar to Australian dollar, Euro to Swedish krona, Euro to Australian dollar, US dollar and Euro to Japanese Yen, Euro to Swiss Franc, US dollar to Chinese Yuan, US dollar to Canadian dollar, US dollar to South Korean Won, Euro to South African Rand, Euro to Indian Rupee, US dollar to Russian Ruble, US dollar to Hong Kong dollar and many more. With this currency converter, you're able to add your favorite currencies and remove the ones you don't need. Add or remove as many currencies as you want and construct the converter according to your needs. Enter the amount in the field next to the currency and you will see the converted results in other currency fields. Just imagine – you are traveling from your home to the country where the national currency is different than yours and you don't know the value of that currency. Just go to the currexy.com currency calculator and convert any currency - it is very fast, reliable and useful. Our converter is always updating with fresh currency exchange rates from the most popular live forex markets, so you are always safe with and guaranteed to get the best and the newest exchange rates. This currency converter works on all devices and does not cause any problems when you’re browsing on the web. You don't have to install any app on your device, just save this page's url and you'll always be able to use perfectly programmed currency converter on your phone, tablet and, of course, computer. The usage of prepared currency converters will save you much time. The main idea is to help you reach your favorite conversion tool in a comfortable way. By saving the urls of your favorite currency calculators, you won't need to google the most common phrases, like "currency converter, currency calculator" and each time have it appear on the site that you don't know or be provided with data which might not be so accurate. So instead, enjoy using our convenient and reliable converter. We are still working and preparing currency calculators for every language and country in the world. The pages with calculators are ready to use, just we have to write some stories and advices how it is better to change currency if you want to save money. We are reviewing best currency exchange offices and common advices to save money when exchanging foreign currency. To do this in different languages and also to analyze every country in the world it is challenge! We've accepted this, and we are serving to all our visitors to reach best user experience when using currency converter. 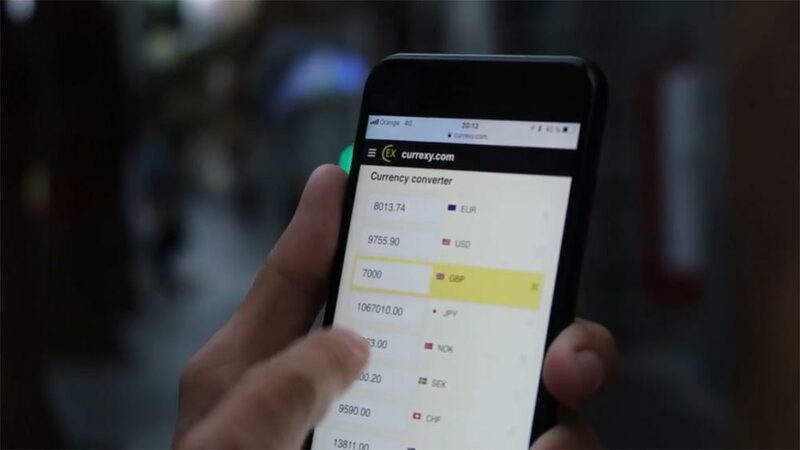 As you see in the video, this currency converter is available to use on mobile phone, everywhere you want, in the street, forest, bar, bank - anywhere. We are ready to introduce you more tutorials how to use currency converter and how to exchange currency at best rates.